If you're a woman who wants to buy your pants from OldNavy.com, go right ahead. Just be aware that the company is trying to convince you that their pants will give you a thigh gap you might not have. In a post on Monday, Roxy of the Tumblr WTF Plus pointed out one plus-size mannequin on Old Navy's website that looks like it's got a weird white-out spot in-between the legs. 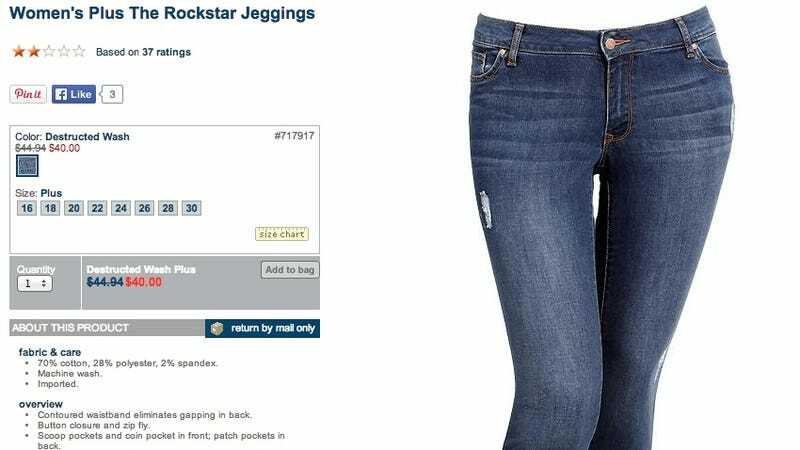 A perusal of the rest of the jeans section indicates that the company's subtly done the same thing to a number of other styles. On some of Old Navy's darker jeans, the photoshop looks less obvious but is still plausible and likely. While this isn't quite as glaringly embarrassing as Target's recent shoddy attempts at their own photoshopping, these small tweaks don't look great for Old Navy either. Additionally, all the jeans in the Old Navy Plus section are worn by mannequins, while all the jeans in the straight sized section are modeled by disembodied humans. So while Old Navy didn't violate the photo of an actual human for their Plus section, feel some feelings for that mannequin whose real body didn't look quite good enough in those jeans. "At Old Navy we strive to show our customers the most accurate representation of how product fits the body. This includes pinning garments on body forms to show how they will actually appear. While we do remove these pins in post-production, we do not use any photo-altering techniques to deliberately distort the actual look or fit of our product."